The popular Asian vegetable daikon bears little resemblance to small, round red radishes found in tossed green salads. Instead, the Chinese white radish, or Raphanus Sativus, resembles a large white carrot. While Japanese cooks rely on daikon's sharp bite to add flavor to relishes and salads, in China, it is used more in general cooking. Chinese white radishes are added to Chinese soups, stir-fries, and red-cooked dishes where the food is slowly simmered in soy sauce. Turnip cake made with Chinese white radishes is a traditional Chinese New Year dish. In addition to Asian recipes, the Chinese white radish is a creative alternative to potatoes or turnips. Daikons are often pickled and make a unique appetizer, providing vitamin C and calcium in your diet. White radish is also an excellent source of potassium. If you can't find any daikon in your local grocery store, try an Asian market. You can also check the ethnic food aisle for pickled daikons. Along with the common daikon radish, there are several other varieties found in South East Asia. The Chinese lobak has a light green color around the top of the roots and leaves. One variation native to Korea is called mu. Korean radishes tend to be smaller but sturdier. One-half is light green, usually spreading down from the top. Lobak and Mu are both considered spicier than white radish. If you're looking for a way to really impress your guest, get your hands on an heirloom watermelon radish. This Chinese daikon has a dull green flesh with a bright red inside. It's a romanticized vegetable, sometimes called the beauty heart or rose heart radish. White radishes aren't just useful in the kitchen; they also have agricultural uses. Farmers often rotate their potato crops with white radishes because the taproot of the radish leaves a large hole in the soil as it decays, this allows the potato to bore deeper into the soil. Using this method, farmers can actually boost their potato yield because the potatoes don't experience the usual growth restrictions. Radishes also retain a great deal of micro and macro-nutrients which help fertilize the soil. You might see Chinese white radishes also referred to as daikon, white radishes, winter radishes, Lo Bak, Low Bak, or Chinese icicle radishes. 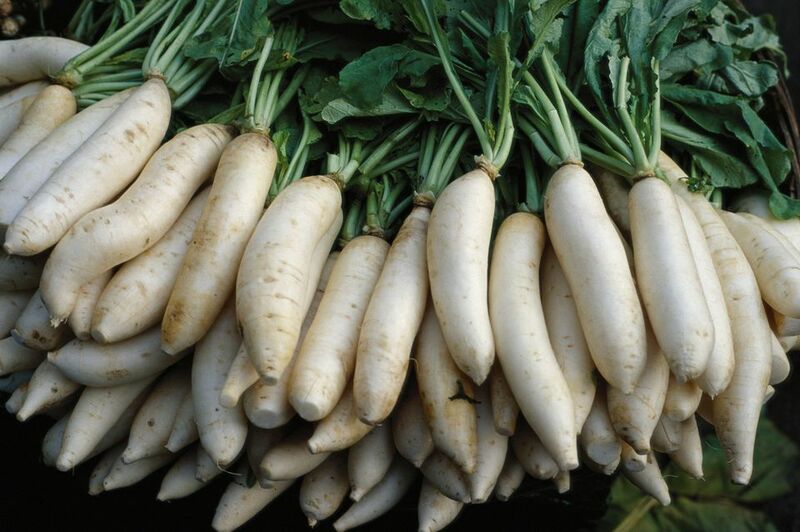 While some of these names also specify a specific variety of daikon, they most often refer to the simple white radish.